Griff Zochran is the star of Nimbus, a fantastic freeware PC platform game created by four students using the Unreal Development Kit. 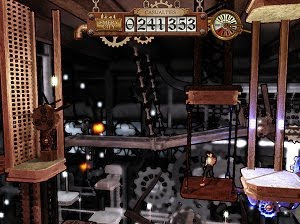 He has to explore the airship Nimbus that he created and stop this infernal machinery. The Nimbus is out of control and is dropping bombs over the city. Who is responsible for this and how can we stop it? Travel across the intricate interiors of the Nimbus and find the crucial points that will make the airship stop dropping bombs. Avoid all the dangers such as fire and steam and successfully jump over the many platforms. However, Zochran has a trick up his sleeve: an electromagnetic device that is capable of reversing the direction of some platforms, lifts and gears. This will add a slight puzzle flavor to the core platforming elements of the game.